Buying replacement parts for your automobile can be a huge hassle. Perhaps it is because the spare part is hard to find. Or maybe you are thinking of buying the part brand new to ensure its quality and you find that it is too expensive. However, the fact of the matter is that replacement parts are a fact of life. You will need to buy them every now and then. So why not make it easier? One way to make it simpler to buy your vehicle replacement parts is to buy them used instead of brand new since salvaged auto parts are as good as brand new ones. It also helps to have an extremely reliable and trustworthy source or used parts dealer to buy your parts from. 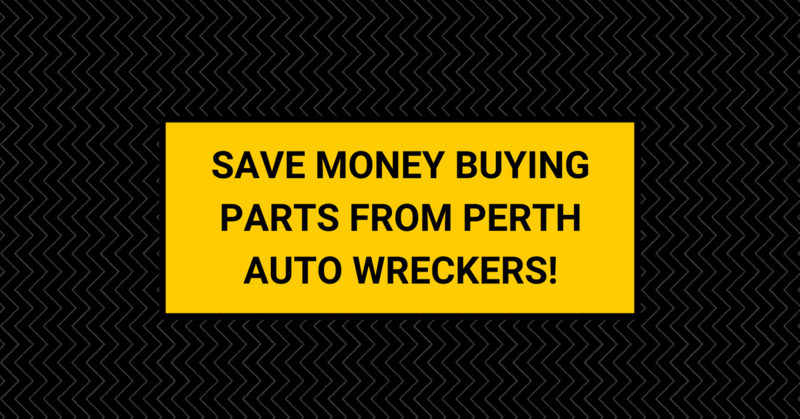 If you live in Perth, you are lucky because you get to take advantage of the skills and expertise of the team here at Perth Auto Wreckers. All you need to know how to browse for car parts in our salvage yards. There are a great many benefits to buying your parts second hand from us. Here are a whole bunch of them! It is a mistake to buy parts brand new. And here is one great reason why. You will save a lot of money if you get your replacement parts second hand. How much money can you save? It varies a little bit, but there is a general percentage you can expect to save when buying parts second hand instead of brand new. This percentage has been calculated by experts to be up to fifty percent. Why buy parts brand new when you can save so much money? When you find a good source for your used parts, you can be sure that they are of top notch quality. One reason for this is the fact that they don’t want to lose customers, so if they sell a bad quality part, that person that bought it won’t be coming back. Losing customers is not a good business model. That is why they do things to ensure that each customer comes back. What do they do? After they remove the part from the junk car that they dismantled in order to gain access to it, they refurbish and recondition the part in question. Then they test it. This is how you know you are going to be buying a part that will last the distance with you. When you buy a second hand part from a Perth auto wrecking company, you can bet that the team working there are going to be highly skilled. And not just that, but professional as well. They will have all the knowledge required to provide you with the best service. How did they get that knowledge? With all the experience they have gathered over the many years they have been in this industry. Whatever part you need they will be able to find it. Quite a few different model parts can be swapped with various automobiles, and this can be confusing for the average layman. But an expert will have the knowledge that is needed to figure out the correct part that you will need. Just one of the many ways that a trained professional is needed in order to get things done. There are so many Scrap Auto Removal Companies wrecking cars and salvaging their parts all over Western Australia that the amount of parts is astronomical. A lot of them are also networked together, making it almost impossible to not find the part you need. Waiting for the correct parts to arrive is a thing of the parts. The levels of efficiency are greatly increased as a result. This is yet another way in which we can all be thankful for the existence of used parts. Every now and then a part that is supplied to someone by the local auto wreckers will not fit. This is not a cause for concern because if the auto wreckers in question are reliable, then they will exchange the part for one that does fit. There is a tiny chance that they won’t be able to find the correct part to exchange with. In this case, you can expect to have the money you paid fully refunded. This is just another one of the many great benefits you can expect to get from buying parts second hand. There is no one company that has a strangle hold on the industry. Instead there are a great many different companies that are all in competition with each other. This means that the prices for used parts are always being kept at a nice low level. You will never find it too expensive to buy parts because of this fact. When a used part is re-used in another automobile after being removed from a clunker, it is being recycled. The materials used to make it are also being recycled. This is often steel that is being re-used. When metals like steel are recycled, this makes the need for steel to be mined get reduced just a little bit every time. And it all adds up. The reason why this is good is simple. Mining is a pollutant. Not just with the run-off polluting the waterways. It also uses up a lot of energy resources, releasing a lot of greenhouse gasses. This is a major contributor to climate change. WA Auto wreckers also help when they wreck cars when they recycle or dispose of toxic materials like engine oil. When they dispose of these chemicals they do so according to strict rules put out by the state. Another great reason for why you should buy parts second hand. You know that your car isn’t going to add to the planet’s environmental woes more than it already has. So buy your replacement or aftermarket parts second hand! You will be glad you did.